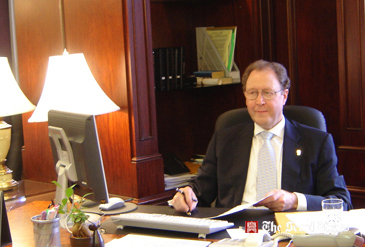 Mr.Holger Hirle, general manager of the Imperial palace sits at his desk for an interview with The Seoul Times. Situated just south of the Han River in the bustling business district of Gangnam, the Imperial Palace is a hotel striving to combine its Korean tradition with modern international standards. Mr. Holger Hirle, a veteran of the hotel business, recently took over the reins as General Manager. In an interview with The Seoul Times, he shared some of his insights into the industry and his plans for the future. Traditionally a Korean establishment, the Imperial Palace has undergone extensive renovations and upgrades in recent years. Nowadays, the artwork and european style decor which grace its interior reflect the changing times. "The fine art and antiques help the hotel to stand out," he explained. "However, we are still very much a Korean establishment." The hotel has only four expatriate staff in testimony to this. Mr. Hirle's philosophy for success centers around selecting and more importantly training his staff to the highest standards. "In creating excellence people are the most important factor," he said. Commenting on the challenges faced in the industry, he referred to the fact that top hotels must strive to stand out in a business that has become increasingly multi-faceted. Citing poolside receptions and Aussie style barbeques as examples, he went on to talk about the attention to detail involved in providing top rate service. "Our Japanese restaurant has recently added Den-Sushi to its menu," he said. "For which some of our chefs spent over three months in Japan learning how to prepare." Starting his apprenticeship some 40 years ago, Mr. Hirle performed stints in the kitchen as a chef and as an administrator. Indicating that he always had his eye on the future, he remarked, "Initially, I tried to select good hotels to work for in order to pick up good references and open doors for myself." He believes the tide is once again turning in the business, in that hotels are once again opting for operators like himself who have worked their way up the chain of command. "Owners are once again realizing that qualifications can't fully compensate for hands on experience," he said. One of the most difficult tasks he has faced in his career was the opening of The Su Roty hotel in Bangkok in the early nineties. 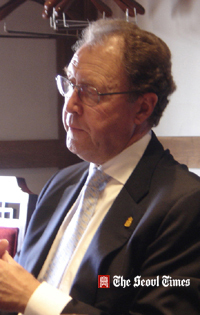 Unlike with the Imperial Palace, he was involved with raising this hotel from the ground up. "Opening a new hotel is one of the most pressurized situations I've been in," he explained. "Engineers, architects and designers can get carried away. There's a need to mix practicality with design." GM Mr.Holger Hirle (right) of Imperial palace interviewed by Mr. Peter McCrossan(left), staff reporter of The Seoul Times. Asked whether he had ever considered other careers, Mr. Hirle divulged how he had pondered becoming a journalist before opting for the profession in which he has now excelled. "My aunt was a writer," he added. "I worked briefly as a roving reporter myself." In hindsight, he seems content with his choice. "I'm still enjoying my job," he said. "The instant rewards and gratification make every day worthwhile." While living in the hotel with his wife leaves them with little free time, Mr. Hirle still enjoys reading, classical music, and travel if his schedule permits. He has a 36-year-old daughter who works as an advertising executive and lives with her Australian husband in Brisbane. Interestingly, this is where Mr. Hirle and his wife themselves hope to retire to eventually. Whilst admitting he sometimes misses Germany, he added, "It's nice to visit, but home is somewhere else now."